A unique award and recognition item. 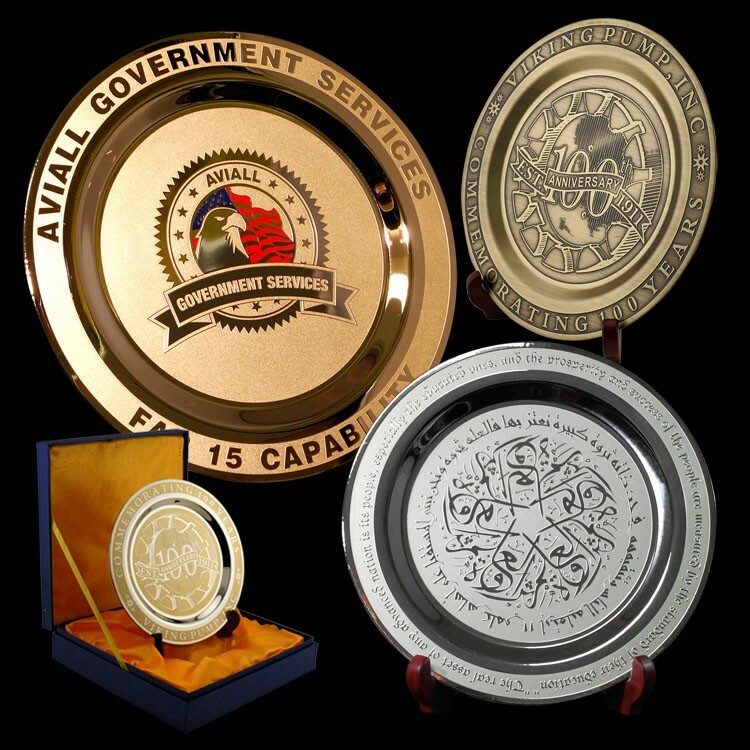 Etched Brass Medallion plates offer a high perceived value at an economical price. 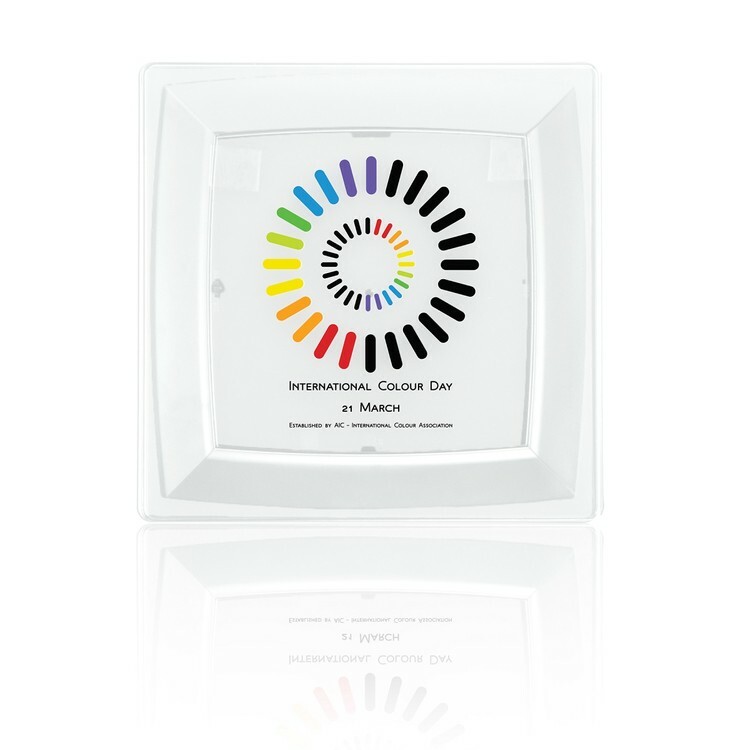 * Choose from Gold Tone, Silver or Bronze finish - or designate achievment levels with different finish colors. * Two tone finish emphasizes design details. * Antique finishes also available. 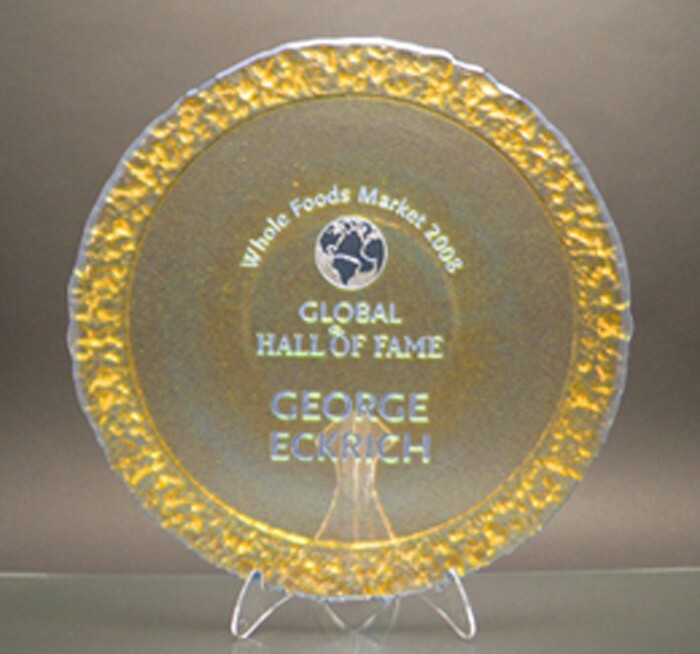 * Unique achievement award, membership identifcation, donor recognition or corporate gift. * Easy to ship, perfect for out of town awards presentations. * Includes wood display stand and deluxe satin-lined presentation box. * Individual personalization and color fill available. * No die or setup charges. 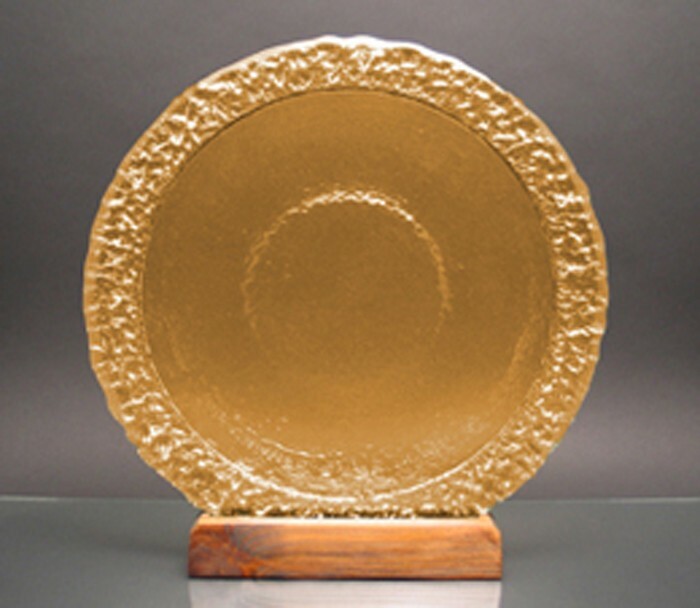 Circle of Excellence Award Plate with 100% Recycled, Refinished but Distressed Wood Base. 2-6% Post-Consumer Recycled Glass. Citrus. 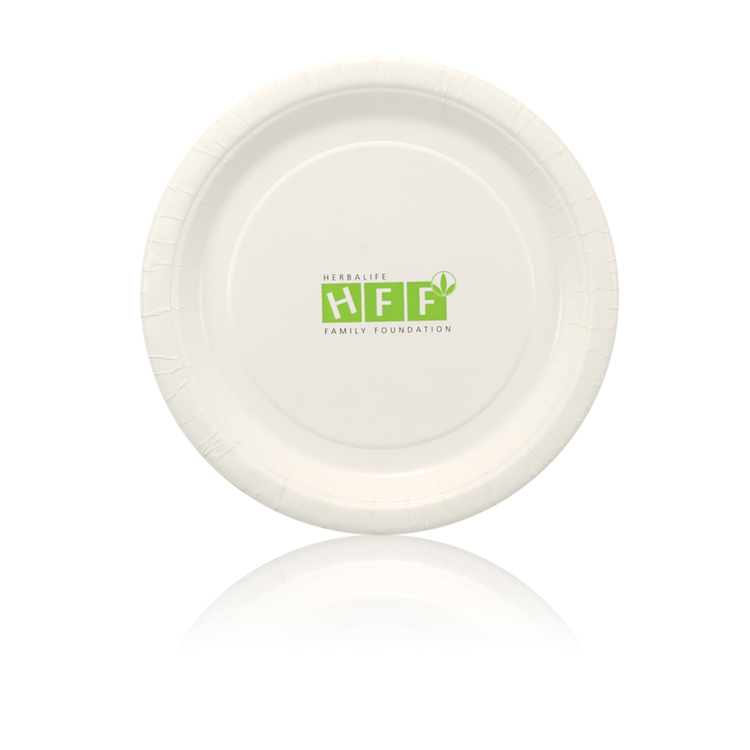 11-3/4"h x 11"w x 4"d.
Our coated White Paper Plates are perfect for getting your name and message out there. The coated White Paper Plates are made from renewable resources. 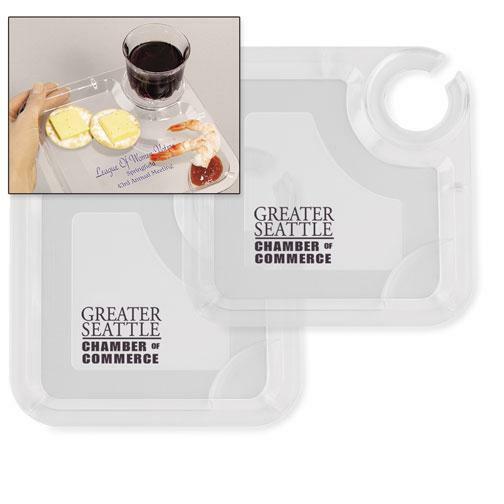 This product is available in 2 print methods: Pad Printed: 1-5 spot colors or printed 4-Color Process. Free PMS matching. Metallic and neon ink colors offered at no extra cost. Made and printed in the USA. Bi-Textured Apollo Platter on Clear Acrylic Stand. 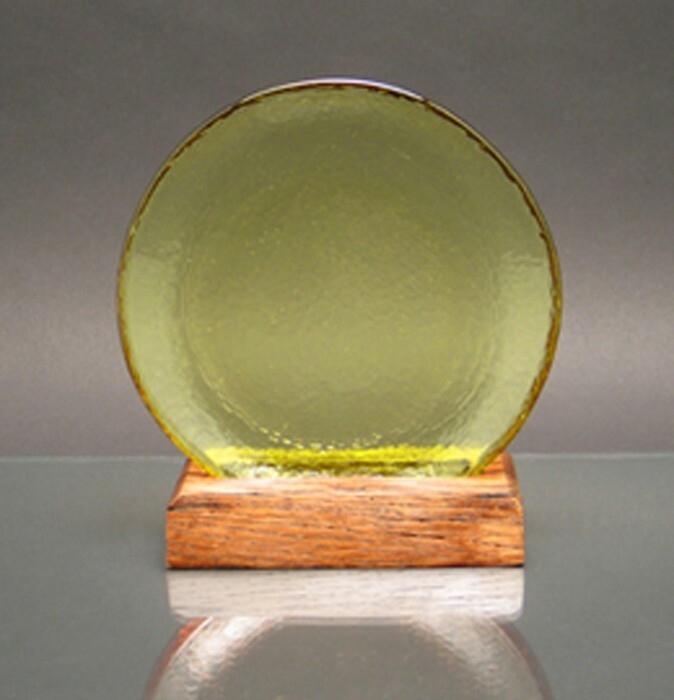 2-6% Post-Consumer Recycled Glass. Citrus. 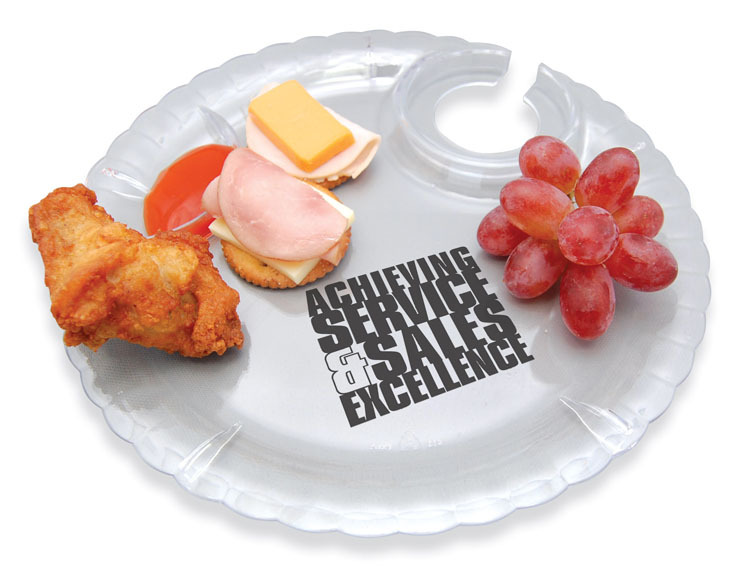 9-5/8"h x 8-3/8"w x 3-1/8"d.
Circle of Excellence Award Plate with Clear Acrylic Stand. 91% Post-Consumer Recycled Glass. Plum. 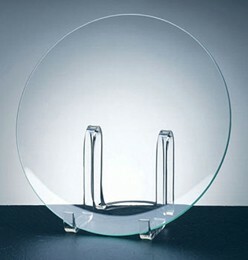 8-3/8"h x 8-1/8"w x 3-3/4"d.
Circle of Excellence Award Plate with Clear Acrylic Stand. 91% Post-Consumer Recycled Glass. Cobalt. 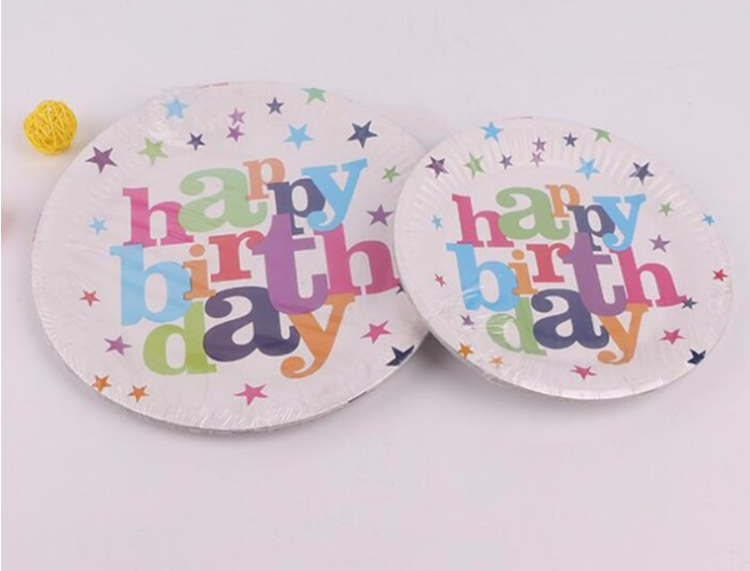 11-1/4"h x 11"w x 3-3/4"d.
Party paper plate is a kind of plate made by paper card. It is cheaper than ceramic and metal one, and safer than plastic and foam one. Besides it can print all kinds of cutomized images. Party paper plates have different sizes for option. The materials we use have several stages which can meet different people's needs. The shape of the party paper plates are various, most common is round, square ones are more and more popular, we can also make unique heart shape which seems much more attractive and beautiful. 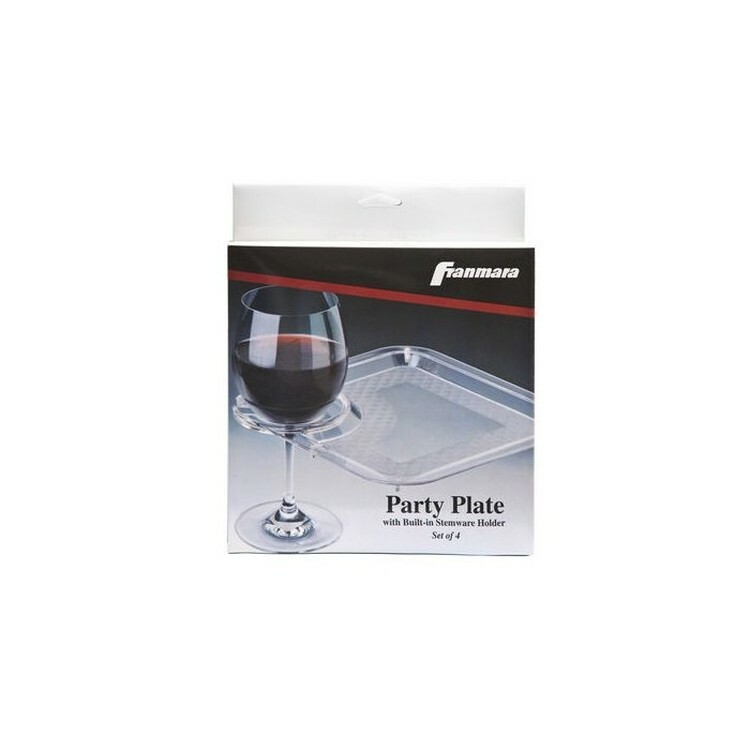 Party paper plate is not only useful, but also can be for decoration. 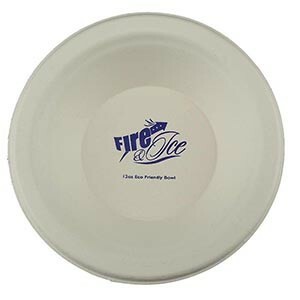 Our White Plastic Plates are perfect for getting your name and message out there. These sturdy plates are made of recyclable plastic. 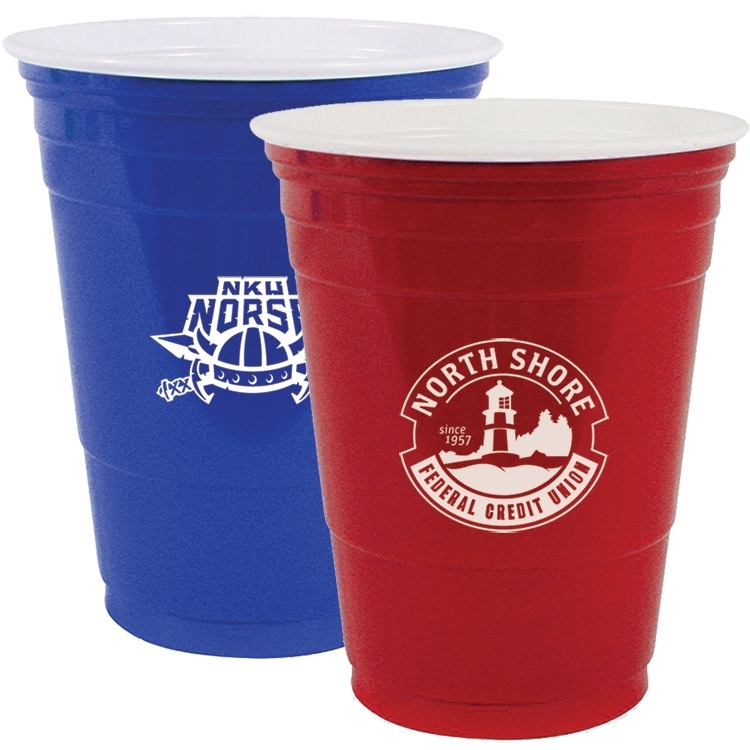 This product is available in 2 print methods: Pad Printed: 1-5 spot colors or printed 4-Color Process. Free PMS matching. Metallic and neon ink colors offered at no extra cost. Made and printed in the USA. Bi-Textured Apollo Platter on 100% Post-Consumer Recycled Wood Base. 2-6% Post-Consumer Recycled Glass. Citrus. 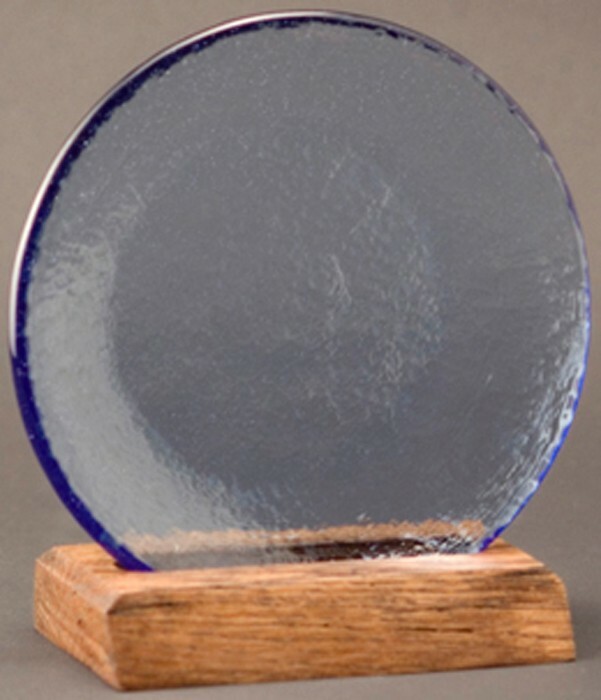 11-1/2"h x 11"w x 5"d.
Circle of Excellence Award Plate with 100% Recycled, Refinished but Distressed Wood Base. 91% Post-Consumer Recycled Glass. Cobalt. 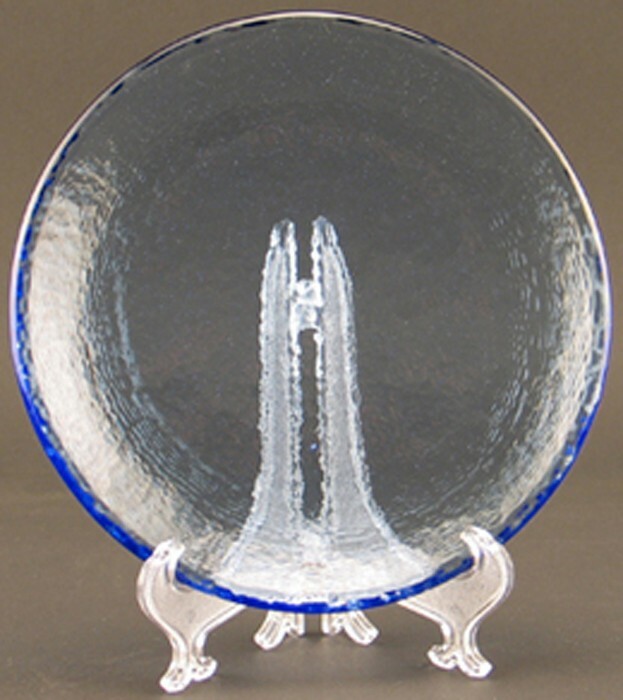 8-3/8"h x 8-1/8"w x 4"d.
Palace Award Plate on Acrylic Stand-Jade Glass. 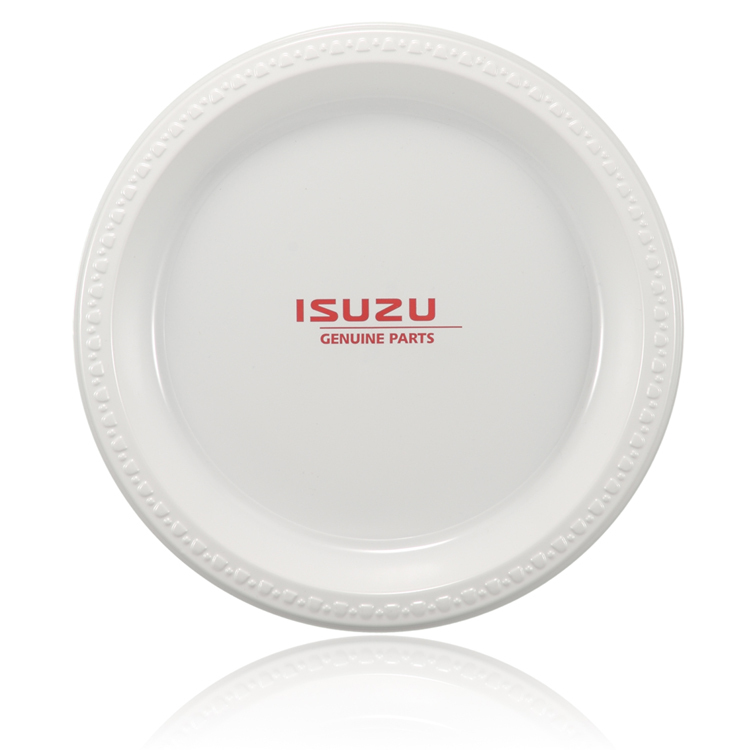 Our Milan plates are perfect for getting your name and message out there. 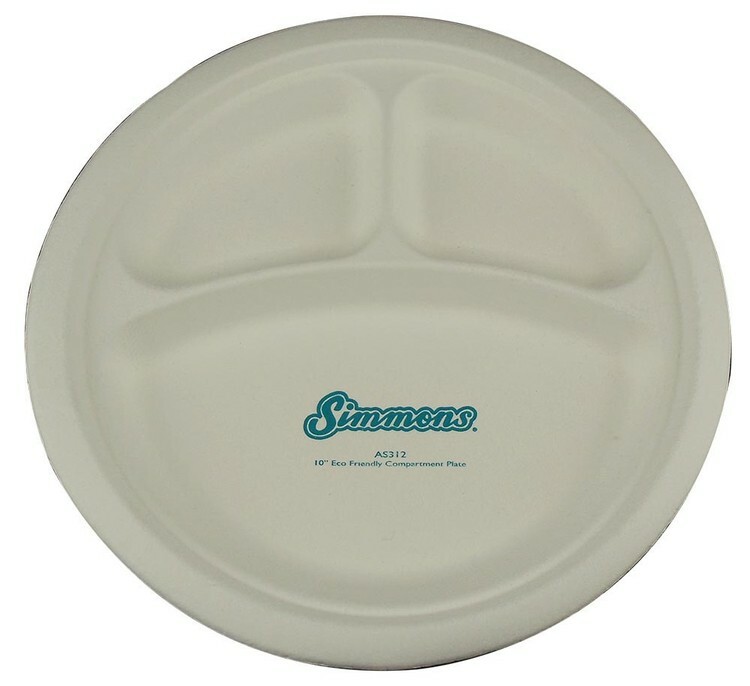 These sturdy plates are made of a recyclable, heavyweight plastic. This product is Digitally Printed with 4-Color Process. White ink available at no additional cost. ** Made and printed in the USA. **White ink will be used as CMYK base coat. For spot colors, it will need to be represented as a layer in the art file and listed on PO in order to print. American Digital printed items with exhibit linear banding. This is not considered a defect. 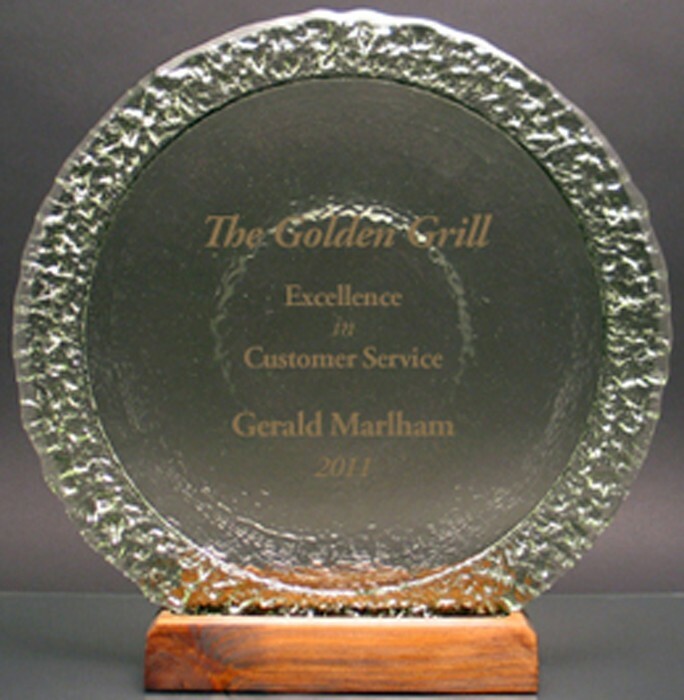 Circle of Excellence Award Plate with 100% Recycled, Refinished but Distressed Wood Base. 2-6% Post-Consumer Recycled Glass. Citrus. 8-3/8"h x 8-1/8"w x 4"d.
Bi-Textured Apollo Platter on Clear Acrylic Stand. 2-6% Post-Consumer Recycled Glass. Citrus. 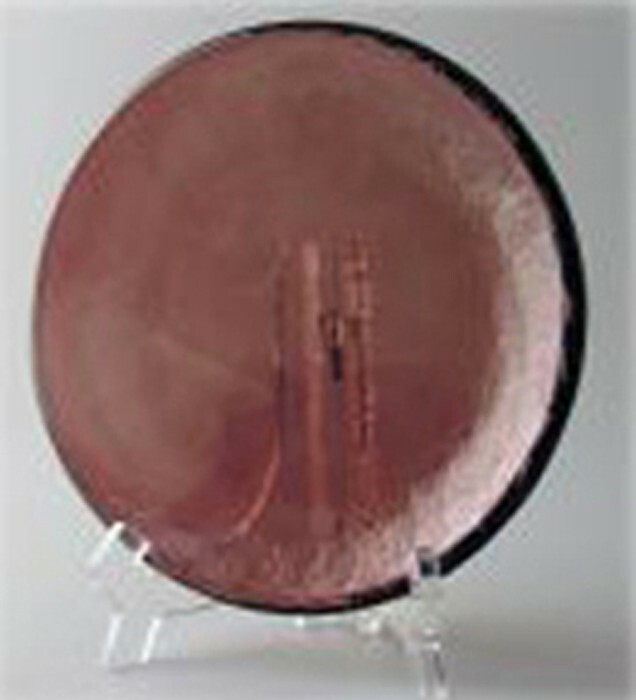 12-1/4"h x 11"w x 3-3/4"d.
Bi-Textured Apollo Platter on Clear Acrylic Stand. 91% Post-Consumer Recycled Glass. Copper. 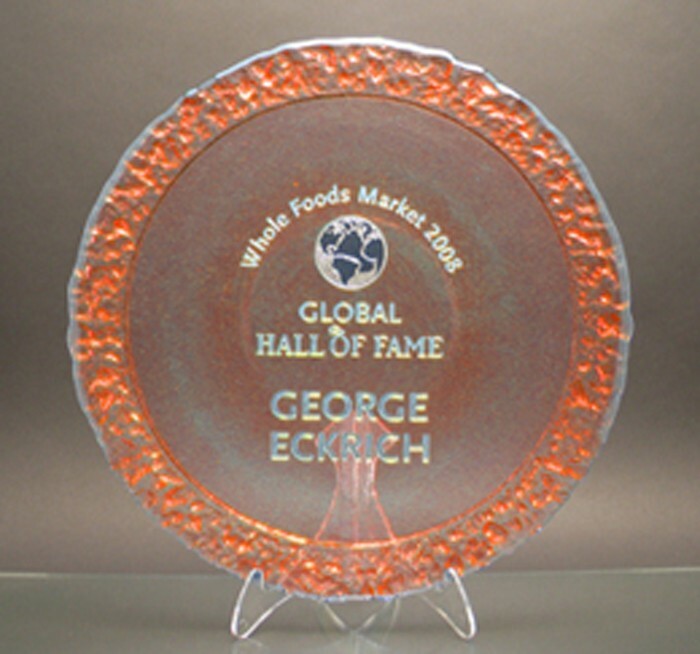 12-1/4"h x 11"w x 3-3/4"d.
Our ClassicWare® plates are perfect for getting your name and message out there. These sturdy plates are made of a recyclable, heavyweight plastic. 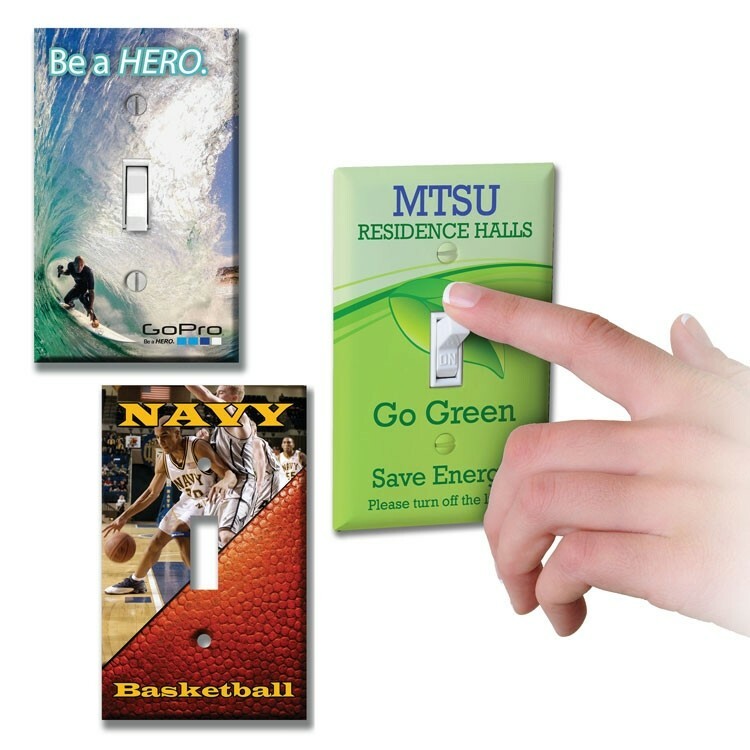 This product is pad Printed and available in 1-5 spot colors. Free PMS matching. Metallic and neon ink colors offered at no extra cost. Made and printed in the USA. 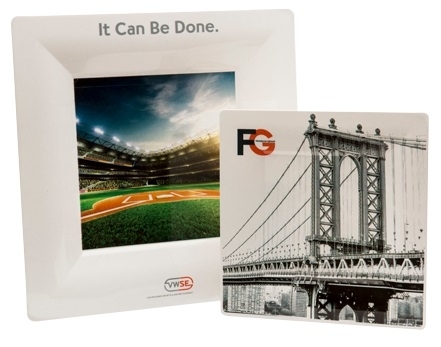 The 6.5" Milan™ Grand™ Plate is the premier plate for promotional events! 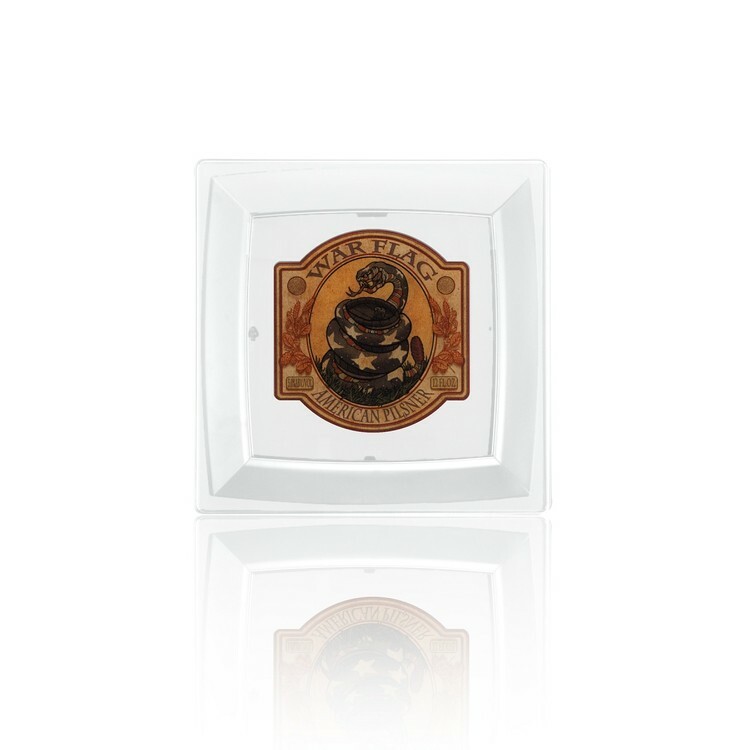 The contemporary and Modern look of this plate is perfect for sit-down events, sporting events, tailgates, bistros, weddings, and social activities! • FREE Paper Proof with Every Order within 12 Hours • 100% USA Made • FDA Approved Materials • BPA Free • Dishwasher Safe • Recyclable • Family Owned and Operated • Worry-Free Customer Service Looking for something bigger? 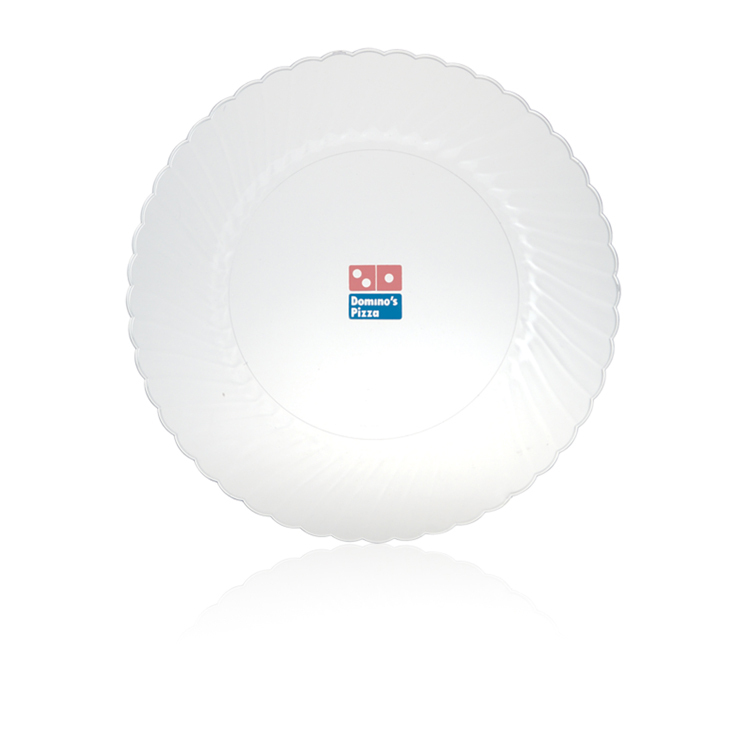 Check out our item " "PLT9RC" for the 9.5" version of this plate. Bi-Textured Apollo Platter on 100% Post-Consumer Recycled Wood Base. 91% Post-Consumer Recycled Glass. Olive. 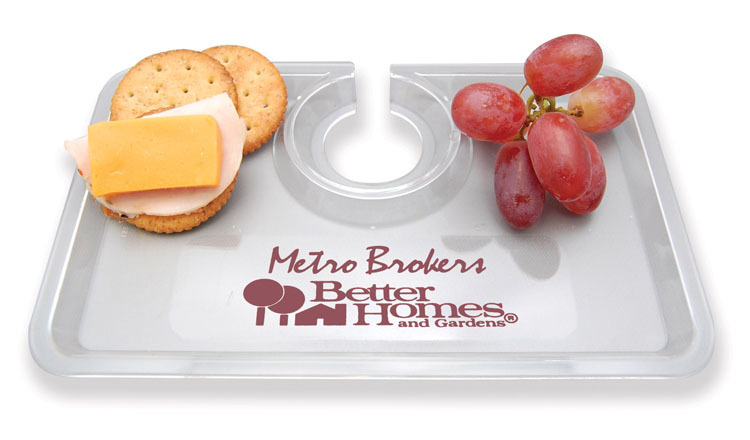 11-1/2"h x 11"w x 5"d.
Our Milan™ plates are perfect for getting your name and message out there. These sturdy plates are made of a recyclable, heavyweight plastic. 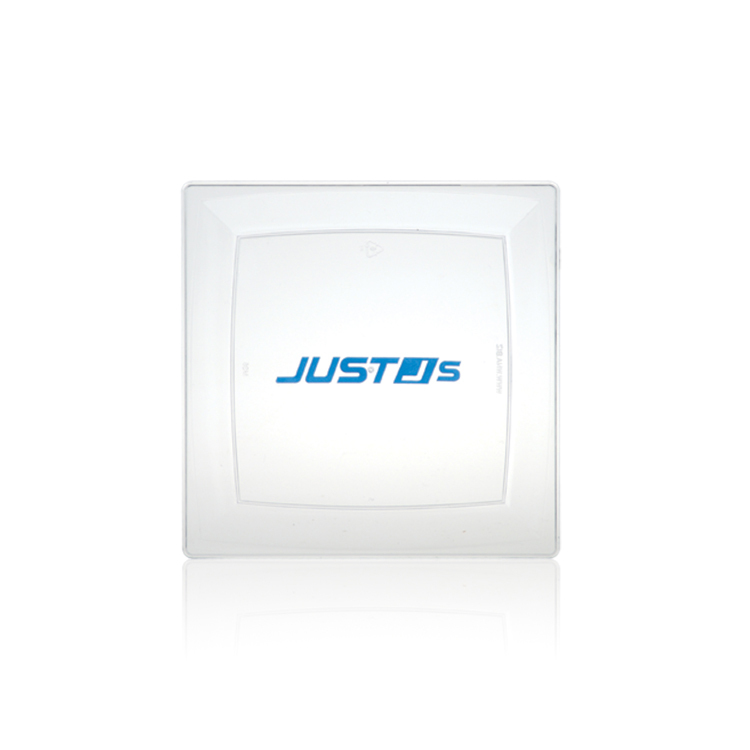 This product is Pad Printed and available in 1-5 spot colors. Free PMS matching. Metallic and neon ink colors offered at no extra cost. Made and printed in the USA.